Viekira Pak is a co-packaged drug combination used to treat chronic hepatitis C (HCV) infection. The pack includes one fixed dose combination drug Technivie (ombitasvir + paritaprevir + ritonavir) co-packaged alongside the drug dasabuvir. The drug components ombitasvir, paritaprevir and dasabuvir are direct-acting antivirals (DAAs) that interfere with the replication of the virus. The drug ritonavir, used frequently in HIV therapy, is included to boost the drug levels of paritaprevir. Viekira Pak is most often, but not always, co-administered with ribavirin and does not need to be taken with pegylated interferon (peg-interferon). Viekira Pak was approved in December 19, 2014 by the U.S. Food and Drug Administration (FDA) for use in adults 18 years or over with HCV genotypes 1 infection, including those with compensated cirrhosis (wherein the liver still functions) and liver transplants. For patients with decompensated cirrhosis, Viekira Pak is not recommended. Viekira Pak is reported to have a cure rate of 95% or more, with only 2% of patients terminating therapy due to intolerance. It is appropriate for use in patients with HIV/HCV co-infection. Two tablets of co-formulated tablets of ombitasvir + paritaprevir + ritonavir (25mg/150mg/100mg) taken one daily in the morning with food, plus one table of dasabuvir taken twice daily in the morning and evening with food. The tablets come conveniently bundled in daily boxed doses, with dosing instructions included on each box. The co-formulated tablet is pink, film-coated and embossed with "AV1", while the dasabuvir tablet is beige, film-coated and embossed with "AV2". For liver transplant patients, Viekira Pak can be taken with ribavirin for 24 weeks only if hepatic (liver) function is normal and fibrosis (scarring) is minor. For patients with moderate hepatic impairment, Viekira Pak is not recommended. 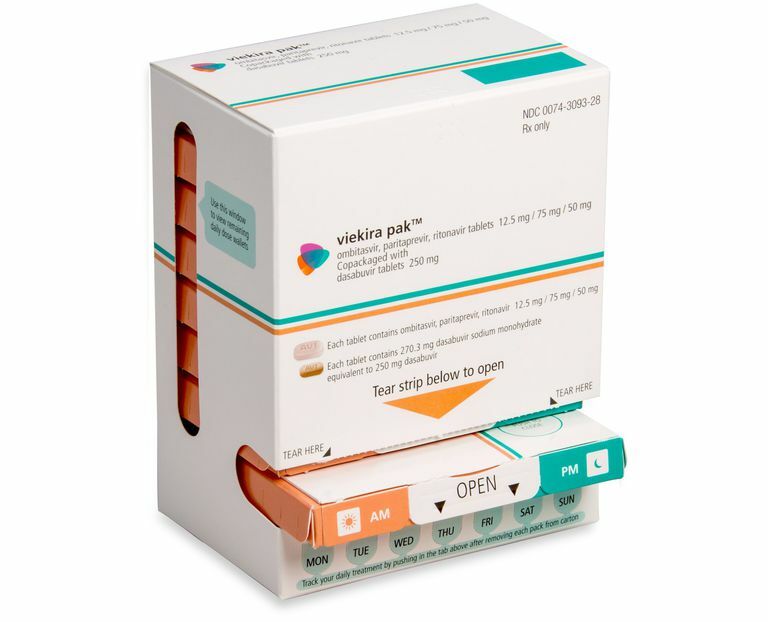 Viekira Pak is contraindicated for use in patients with severe hepatic impairment. Viekira Pak is also contraindicated for use in patient with known hypersensivity to ritonavir (including Stevens-Johnson Syndrome, a potentially life-threatening, all-body inflammatory reaction). Viekira Pak is contraindicated for use in pregnant women when used with ribavirin. It is recommended that all women of child-bearing age be monitored monthly for pregnancy during the course of therapy. It is also recommended that the patient and her male partner be provided at least two non-hormonal methods of contraception, and that they be used during the course of therapy and for six months afterwards. U.S. Food and Drug Administration (FDA). "FDA approves Viekira Pak to treat hepatitis C." Silver Spring, Maryland; press release issued December 19, 2014.